In the last three articles it was proposed that the author of the 408 cipher may have left his identity within the final 18 characters. He specifically told us that he would not give us his name, but assured us his identity was concealed within the cipher - reasoned to be something like "I am the Zodiac Killer." The theme of his identity and name were integral to the final third of the cipher and letter mailed to the San Francisco Chronicle on July 31st 1969, and may very well have manifested through both his second and third ciphers as well. The third cipher began with "This is the Zodiac speaking. By the way have you cracked the last cipher I sent you. My name is...."- therefore, the final line of the second cipher (340 cipher) may be the 'narrative bridge' between the first and third cryptic offerings. The first cipher achieved everything the Zodiac Killer had wished for. He had fashioned using threats and newspaper rivalry maximum exposure for his handiwork, which was very quickly published by the Vallejo Times-Herald, San Francisco Examiner and San Francisco Chronicle. The failure of Zodiac to give us his name did not satiate the desire of some in the quest for the real identity of the killer, and was championed by Dr D.C.B. Marsh, president of the American Cryptogram Association, who on October 22nd 1969 in an article published by the San Francisco Examiner, stated "The killer wouldn't dare, as he claimed in letters to the newspapers, to reveal his name in a cipher to established cryptogram experts. "Zodiac" had not done this, Marsh suggested, because to tell the complete truth in relation to his name, in cipher code, would lead to his capture. I invite 'Zodiac' to send The American Cryptogram Association a cipher code-however complicated." ​This article was not to go unnoticed by the killer, who, two and a half weeks later mailed his infamous 340 cipher, unsolved to this day according to official sources. This cipher was to become the all-important bridge between cipher one and three. If he gave us his identity (the Zodiac Killer) in the unsolved 18 characters of cipher one, and stated "my name is" in cipher three (supposedly giving us his name), then by logical extension, cipher two should have been the promise of a name, and the conduit between the two. If we can provide a compelling reason to show that the near-Zodiac on the final line of the 340 cipher was actually intended to be deciphered to 'Zodiac', then we are left with the final two characters of the cipher to decode, thereby bridging the gap between cipher two and three. Using the most powerful supercomputers in the world and the talent of some of the brightest minds in cryptography, the 340 cipher has failed to buckle. So, it's time to use the character of the Zodiac against himself, and his willingness to respond to the newspapers. If the Zodiac Killer is responding to Dr D.C.B. Marsh, then he clearly isn't prepared to give us his name immediately in the November 8th 1969 '340 cipher', as the opening line in his April 20th 1970 communication would testify to. It would be over five months later that he stated "my name is". Therefore, the final two characters of the 340 cipher are the conclusion to an open-ended promise of something more to come, in similar fashion to "my name is." The Zodiac Killer certainly wasn't going to miss the opportunity to keep Dr D.C.B. Marsh and the public waiting just a little bit longer. The statement of "by the way have you cracked the last cipher I sent you" is superfluous, as he knows only too well the 340 cipher has not been cracked, yet, it also lacks his usual abrasive sarcasm. However, it is followed by "my name is", and therefore could be construed as the conclusion to his promise from the final line of his 340 cipher and to Dr D.C.B. Marsh, and the allegorical bridge between the two ciphers. April 20th 1970 letter. Click to enlarge. But how do we know that the near-Zodiac on the final line of the 340 cipher was to be decoded to 'Zodiac'? Because he fashioned a bridge between cipher two and three using his pseudonym. Placing the real spelling of Zodiac under the '340 cipher' version of Zodiac, and counting the alphabetical difference numerically between the columns (see here), we achieve the numbers 000888. When combined, the three circled 8's found on the '13 Symbol' cipher. These six characters of the 340 cipher were effectively carried forward numerically and placed front and center of the '13 Symbol' cipher design. You will also notice that the two characters either side of three 8's (shown on the right), are both visible either side of the near-Zodiac on the 340 cipher. A total of eight characters and three circled 8's the common link or bridge between cipher two and three - in which the name of Zodiac played a pivotal part in the formation of the 'My Name is Cipher'. The story is now complete. 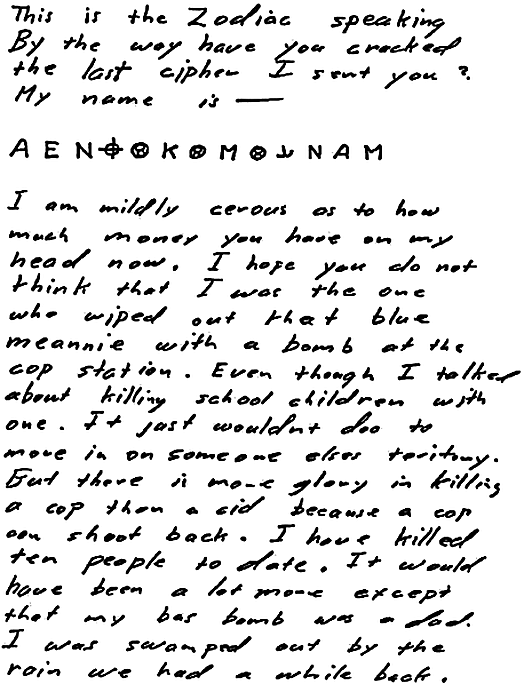 The Zodiac Killer stated on July 31st 1969 "I will not give you my name, but in this cipher is my identity." He promised in the 340 cipher, in a response to Dr D.C.B. Marsh, that he would soon reveal his name. Then, five and a half months later, on April 20th 1970 he stated "This is the Zodiac speaking. By the way have you cracked the last cipher I sent you. My name is...."
Do ciphers two and three really contain a full and coherent message, not dissimilar to the 408 cipher solution, or had the Zodiac Killer taken Dr D.C.B. Marsh's advice "to send The American Cryptogram Association a cipher code - however complicated", and taken it a step too far? Richard, here below is a legitimate cipher which only took me about 15 minutes to encrypt using pen and paper. It has all of the elements you see in the 340, symmetry, apparent divisions into halves and parts, a few interesting words thrown in: COP I POP, BOO, SFPD, TOSCHO the TOTO, KCBS Radio, a couple of SCHOZ's (shots), and of course a final tantalizing ZODAIK. I used 408 characters so it looks like an actual Zodiac cipher. I am sure our human tendency to Apophenia will find plenty of other things related to the Zodiac universe if people look hard enough. Amateur cryptographers will have this cipher speaking like a drunk on weed in no time! They will of course find things that were never intended and will probably apply anagrams as a last resort, when actually this cipher uses no anagrams. They will make too many assumptions. They will get it completely and utterly wrong. Nobody will ever solve this of course, even though it is perfectly legitimate and therefore "solvable". The fact that people cannot solve it is not reason enough to call it a fake. But the purpose of a cipher is to communicate a message. The purpose of a cipher is to be cryptic. Let me reply to your statement by posing another real-life example. Solution: No solution to Part 4 has been publicly acknowledged by either Jim Sanborn or Ed Scheidt to be correct. Clues given: When commenting in 2006 about his error in passage 2, Sanborn said that the answers to the first three passages contain clues to the fourth passage. In November 2010, Sanborn released a clue, publicly stating that "NYPVTT", the 64th-69th letters in passage four, become "BERLIN" after decryption. Sanborn gave The New York Times another clue in November 2014: the letters "MZFPK", the 70th-74th letters in passage four, become "CLOCK" after decryption. The 74th letter is K in both the plaintext and ciphertext, meaning that it is possible for a character to encrypt to itself. This means it does not have a weakness, where a character could never be encrypted as itself, that was known to be inherent in the German Enigma machine. It is believed that the "BERLINCLOCK" plaintext may be a direct reference to the Berlin Clock. Sanborn further stated that in order to solve passage 4, "You'd better delve into that particular clock," but added, "There are several really interesting clocks in Berlin." I say again, just because it can't be easily solved does not mean it is not a legitimate cipher. "But the purpose of a cipher is to communicate a message." Well um, yeah, haha. But your statement is very ironic because a cipher can only communicate its message ONCE it has been solved. Depending on the kind of cipher it is, the cipher can be simple or it can be extremely complex. We can only conclude that given the sheer number of man and computer hours that have been spent on the 340, it must be either very complex or a fake cipher. The Zodiac was not an ordinary communicator. He may have thought of it all as a game, but he was a serial killer first and foremost. If he wanted to communicate anything, it was this: He wished to be seen as someone smarter than the police. The newspapers were more than willing to indulge him with this fantasy. Most of what he wrote about was very vague and cryptic, and never too revealing about his identity. Why should we think his ciphers will be any more illuminating or easy to interpret? If at first you don't succeed in being smarter than the police (or their helpers), what do you do? You up the ante by making your cipher just that bit more complex. Did the Zodiac take it too far and created a cipher like the one posted above? Communicating is one thing. Understanding is something entirely different. And nobody really understand the Zodiac's intentions re his voluminous correspondence. Sure he corresponded, but how much of what he wrote about had any meaningful interpretation? He provided some details about the crimes and talked about killing more people and provided vague ideas about radians. Perhaps in the future we will have computers that will solve the 340. At present we are barely scratching the edifice. To write off the cipher as a fake may be just a bit hasty. I am trying to understand some of this cipher stuff, but am also an oulde, so it's a little bit of a struggle. So what if the key is discovered, but the message itself is a word puzzle that requires an overlay in order to be revealed? Does that make any sense? That would seem to make the cipher unsolvable using traditional means. Hi Tom, I can only answer that by saying "Anything is possible". It could involve 2, 3, 4 layers of different encryption techniques. Or it may involve only one very complex technique. At present, nobody knows. There are plenty of methods that he could have used. He was possibly not an expert at cryptography but did have some rudimentary training or understanding of the process, and I suspect that when pressured into performing, he may have did his best to prove himself. As Richard suggests, he may have taken it too far. The way I see it, Z wanted to communicate with the same people he saw as the "enemy", while also wanting to be smarter than them. So his ciphers became like a "show pony" for the press. As Richard pointed out he was under some pressure to prove himself and excel in the field of cryptography. One of his prime motivations was to taunt the police with complex puzzles. After the first cipher was cracked in a short space of time, the idea of being "un-crackable" may have become more important to him than a solution. When professionals like Dr Marsh requested a cipher, "however complicated", the Zodiac may have taken this as a challenge. It was a request to prove his abilities. It may even have been perceived by him as a backhanded taunt. The ciphers sent by a serial killer will always be very different to normal ciphers. They will always be unusual. It is certainly an odd thing to do, to send encrypted messages to the same people who you consider your "enemy" (the cops), while also feeling a need to feed the people (civilians) with more fear and intrigue via the TV and radio. The stakes for him to "succeed" were possibly never so high as when he posted that second cipher! He could have meant that his identity was being revealed in his behaviour, methodology, and world view, not so much in the coded messages themselves. If the 340 is in fact gibberish, that in itself may be a huge clew. Perhaps. But serial killing is generally the "ulterior lifestyle" not the norm. In regular life some serial killers may just seem a bit eccentric or prone to the occasional angry outburst or tantrum. They may spend hours cussing at the lawnmower and kicking it if it fails to start for example. Or they may be very patient and calm. They may be cruel to animals, or just the opposite. Some may appear very normal and average in their day to day lives and are never suspected by anyone close to them. On methodology I would say yes, he always wanted the police and press to be "correct" in how they reported his deeds, or at least "correct" from his point of view. He wished to be "presented" in certain ways that were pleasing to him. And yes, as you suggest, he may have simply been a pathological liar whenever it suited him. But I can guarantee he would not have been happy if the police or the press had called him a liar! His ulterior persona would have found a way to retaliate in order to "correct" this "wrongful" perception about him. That it is it,in a nutshell,''Cryptogram''. Then,the Hardens,without any intentions to conspire,go and ''tan his hide''. Sadly,a ''theatrical'' production,at Lake Berryessa....and then a ''copycat'' I.R.A. murder at Presidio Heights,precisely two weeks later. In November 1969,the ''340'' cipher would represent ''restitution'' of the Zodiac's pride,in himself. A case of : '' Now,do you understand that I am angry ? And,I want the world to know about it. Yes Rubislaw 32, he was not a "happy camper", that much is certain. The theatrical production is mystifying in itself. His wider audience depended on the two hapless cast members who he railroaded into "the production" surviving the plot for long enough to re-tell it.